The arts play an important part in our community, our schools, and in the lives of individuals. Our educational system needs to emphasize the arts and use it as a vehicle for learning and self-expression. Art is way to touch the values and beliefs of the world and communication the needs of the soul. As former President John F. Kennedy stated, “I see little of more importance to the future of our country and of civilization than full recognition of the place of the artist. If art is to nourish the roots of our culture, society must set the artist free to follow his/her vision wherever it takes him/her.” Art on the Wall is place for the child to have a voice, a place of expression for the artist in everyone, especially the students of today. For it is true that art defines us all. Students spent all term exploring how to draw the human figure. Live models where the object of choice, but sleepy students dragged from a study hall were not always available to play the part. The smartboard and a handy computer often solved the problem through a computer site called Posemaniacs. Pose Maniacs supports all artists, including art students and people who study illustrations and mangas on your own. This quick video shows how it can be used to practice quick poses. Students both enjoyed working off the smartboard and choosing various complicated poses. They where able to take the knowledge learned in a real life setting and incorporate into the information presented on the computer site. The natural reaction is to throw out those old sharpies and go with the new. 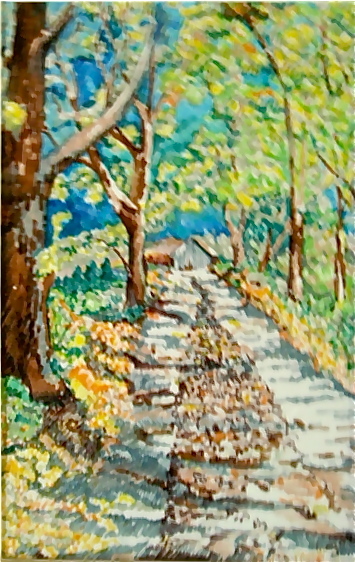 But using the older, running out markers can offer the artistic student a way to create interesting shading and tones. The idea of using markers beyond the level of poster making may also seem a novelty in the art class. 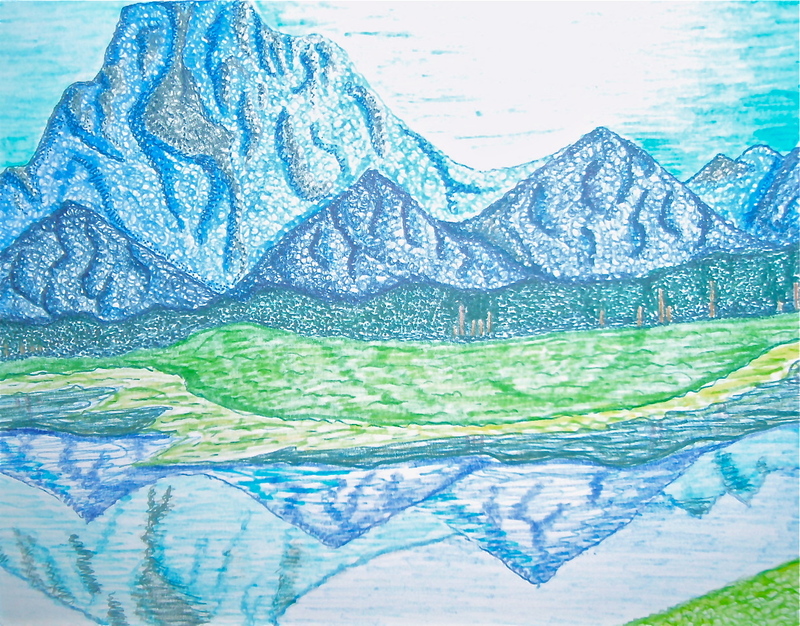 But working with both new and old markers can create wonderful and successful artworks. These students used the approach successful and incorporated various textures and tones into their artworks. 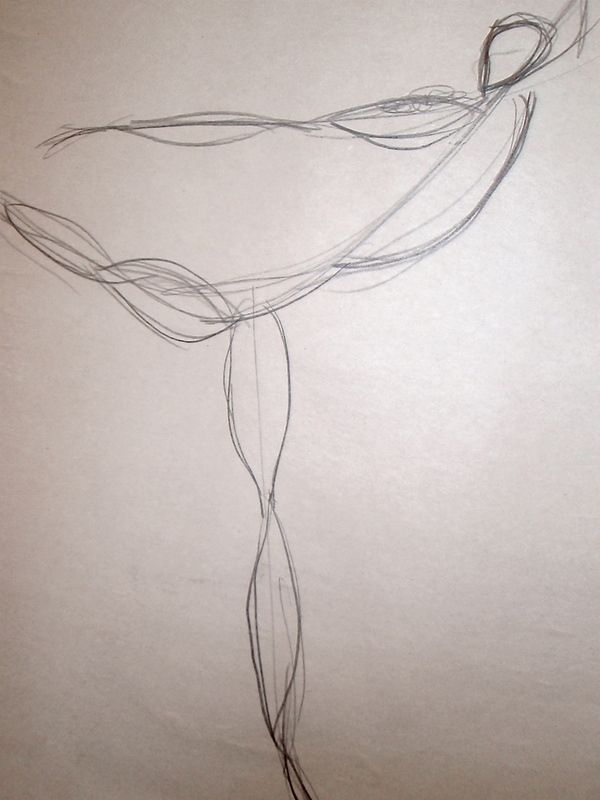 The students built upon their previous knowledge of line and form,as well as, the development of good composition. Although there maybe be cries of dismay as a marker runs out before intended, it was a good lesson in patience and problem solving to reach the desired ends. 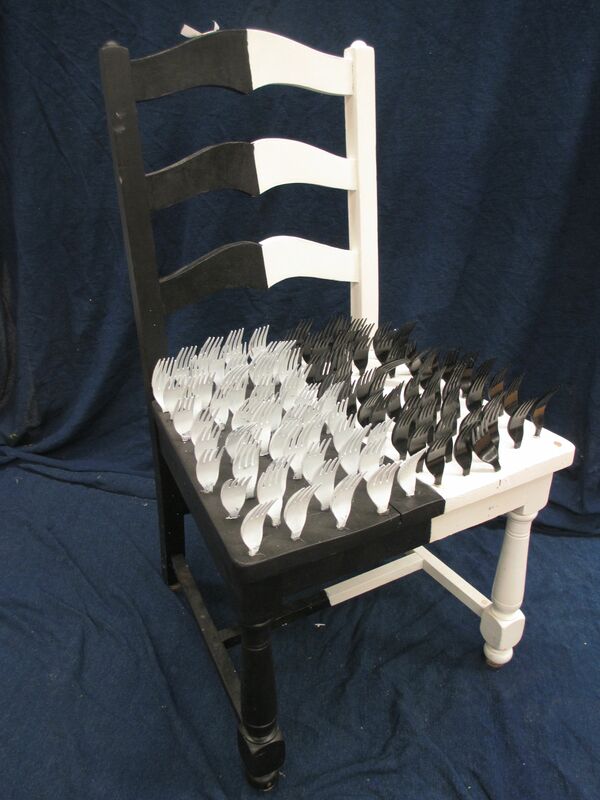 This lesson can be introduced with the works of a New York City artist, Enrico Miguel Thomas. 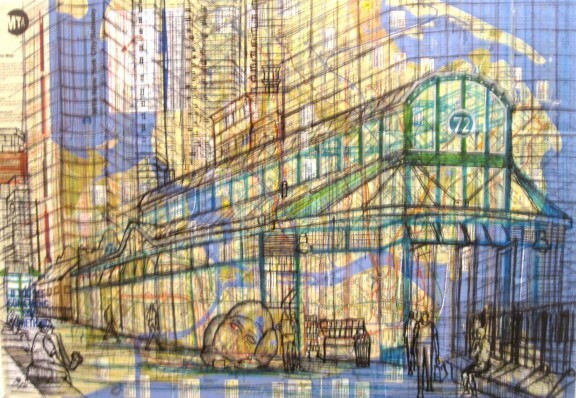 He is a Brooklyn based artist who draws on subway maps, to capture the images of the trains and beauty of the city. 72nd St station on a New York subway map by Enrico Miguel Thomas. More information on the artist can be gotten on his blog on the Sharpie site. http://blog.sharpie.com/tag/enrico-miguel-thomas/?sid=enUS There is a quick video where students can see him in action. Set an example try it your self, the results can be amazing. A Dutch artist Sjors Vervoort has been making animation art with pieces of folded and painted paper, as well as cardboard. His work was inspiration for students to create their own videos using their constructed cardboard words. 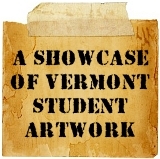 The students were given the opportunity to create a similar project. The assignment: to build a 3 Dimensional word in a small student group. The word will be 28 inches by 3 inches, made of cardboard and plaster strips. The second challenge was to place the word in an environment and create a video, animation or photo montage. The high school students and the media students at RTCC collaborated to work on the animation and video process. The results are wonderful! 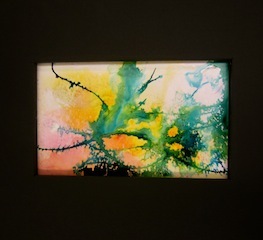 The word COLOR was a simple but creative reference in the art room as the video illustrates. Another group of students experimented with the letters H2O. Collaborative thought, creativity, and technology produce imaginative results! BETTE RIDGEWAY – Poured Paintings is inspiration for art students unit of study. The students first got inspired by watching a video on artist Bette Ridgeway. They learned how she simultaneously directs and randomly pours color to emphasize rhythm and motion. The student then had a chance to develop their own poured paintings, developing both the random and planned aspects. Choice of color played an all important role in the creation of the works. The ideas were also applied to 3 Dimensional paper cutouts. 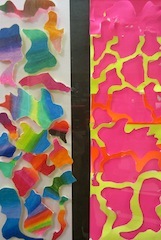 (foam core with florescent papers and color pencil). This time the use of negative and positive space was incorporated into the lesson. 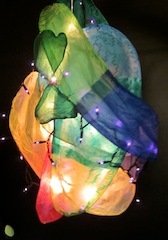 The third adaptation involved creating a tissue paper and wire funky lantern. 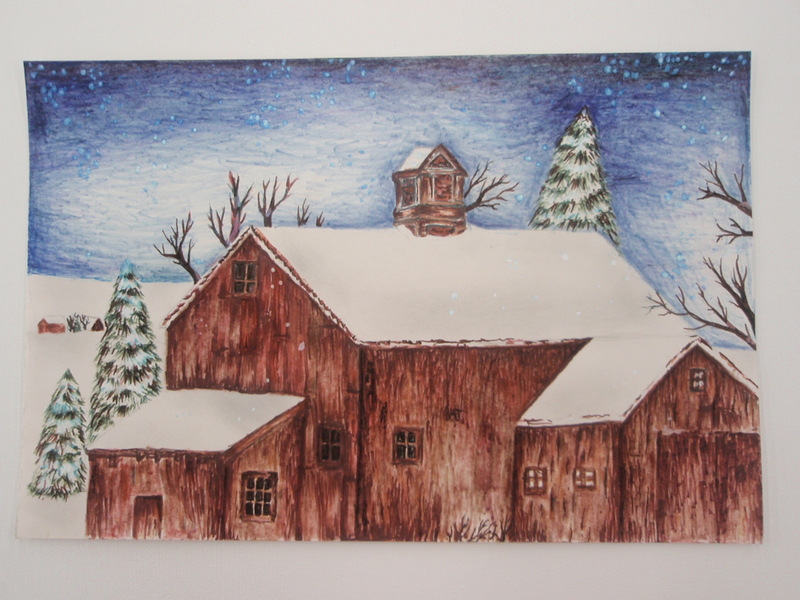 The illumination inside was the result of inserting twinkle lights. The student results illustrate how the learning can be applied across the mediums. 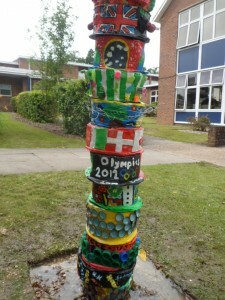 Abby Birhanu, a fellow Fulbright Exchange Teacher (UK 2011-2012), did a totem pole project with her students in the UK. The project was developed with some advice from Pat Cushing and Gary Jackson. Gary and Abby communicated through emails which were very helpful in explaining the process he used in his summer camp project. 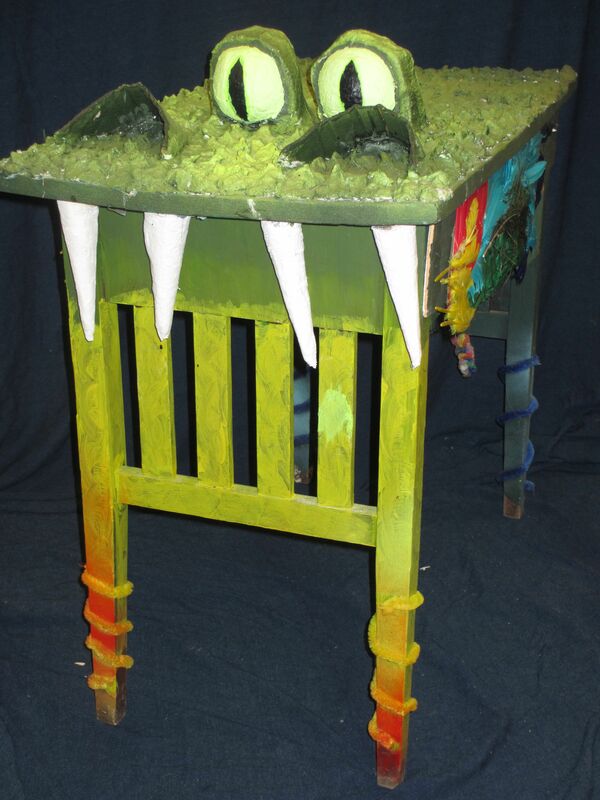 Gary Jackson has a great blog art teachers will love and find usefull for other inspirational projects. The process was a blast; here’s the outco me in Abby’s own words. They really enjoyed the project and when we dug the hole to put in the pipe we found clay and got to experience where clay comes from first hand. It was a blast! I have attached the finished product. The clay is outdoor clay and we painted it with themes dealing with cultural exchange and environmental sustainability as a way of promoting a healthier Earth in all respects. The clay also has recycled material on the surface and is filled with gravel like you suggested. It was the hit of of our school. The school’s name is Charters and it is in Sunningdale, England about 30 minutes outside of London. 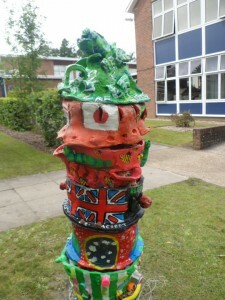 The totem pole created by Abby Bihanu’s UK students. forward to doing a similar project with my home school in Missouri. Providing the opportunity for arts learning is an important aspect of education. For years the Dana Foundation as well as other groups have been studing the effects of the arts on learning and cognitve skills of children. Scientists have grappled with the question of why arts training has been associated with higher academic performance. In 2004, the Dana Arts and Cognition Consortium brought together cognitive neuroscientists from seven universities across the United States to address the question. 1. An interest in a performing art leads to a high state of motivation that produces the sustained attention necenssary to improve performance and the training of attention that leads to improvement in other domains of cognition. 2. Genetic studies have begun to yield candidate genes that may help explain individual differences in interest in the arts. 3. Specific links exist between high levels of music training and the ability to manipulate information in both working and long-term memory; these links extend beyond the domain of music training. 4. In children, there appear to be specific links between the practice of music and skills in geometrical representation, though not in other forms of numerical representation. 5. Correlations exist between music training and both reading acquisition and sequence learning. One of the central predictors of early literacy, phonological awareness, is correlated with both music training and the development of a specific brain pathway. 6. Training in acting appears to lead to memory improvement through the learning of general skills for manipulating semantic information. 7. Adult self-reported interest in aesthetics is related to a temperamental factor of openness, which in turn is influenced by dopamine-related genes. 8. Learning to dance by effective observation is closely related to learning by physical practice, both in the level of achievement and also the neural substrates that support the organization of complex actions. Effective observational learning may transfer to other cognitive skills. The arts in education continues to maintain a position of investigation and importance. Integration of the arts into all areas of study have shown to improve cognitive development. Lets all work togethe to keep the arts alive in our schools.